In 1999, I went to the Byron Nelson Invitational golf tournament in Irving, TX and followed around a 19 year old golfer who was making his professional debut - Sergio Garcia. Just a month earlier, I had watched Sergio take home the Silver Cup at the Masters Tournament for having the lowest score of any amateur. At the time, I was only a few years older than Sergio himself and I was fascinated with the joy and youthful exuberance he brought to the game. In the first round of the Byron Nelson tournament, Sergio fired a 7 under par 63 and I immediately became a fan. Later that year, the rest of the world saw the same excitement when Sergio battled Tiger Woods in the 1999 PGA Championship at Medinah Country Club outside of Chicago. Sergio came close to capturing his first major title that week, finishing in 2nd place behind Tiger. The golf world thought he would become a potential rival to Tiger similar to what Jack Nicklaus had with Tom Watson or Lee Trevino. No one at the time would have guessed that Sergio would come so close over the next 18 years finishing second 3 more times with 22 top 10 finishes and no major titles. He would win tournaments - 9 on the PGA Tour and 15 on the European Tour. He also became one of the key members of 8 European Ryder Cup Teams with an impressive 19-11-7 record. I watched a large majority of the Masters this past weekend and saw a different Sergio. He seemed more focused, mature and calm. Not letting bogeys effect him the way it had in the past. Instead of fading when faced with adversity, he fought back to win his first major title. 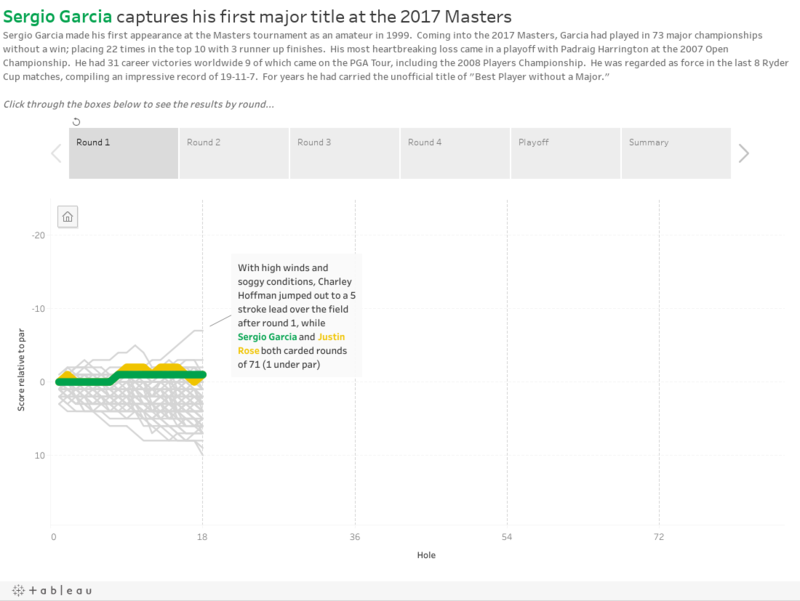 I created a similar visualization as part of a dashboard that I did after the 2015 Open Championship, but this time I wanted use it to tell the story of the 2017 Masters and his duel with Justin Rose. Last month my soon to be 9 year old daughter came home from school all excited about career day. This year they could dress up as what they wanted to be. I figured like most kids she would pick something like veterinarian, teacher, fire fighter, etc. 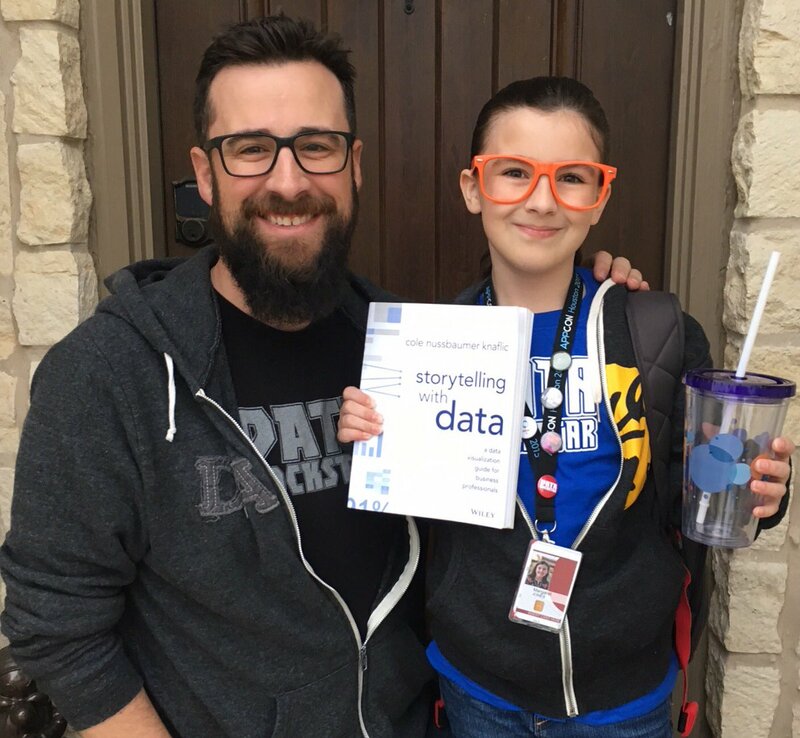 Not Maggie, she declared that she wanted to be a Data Rockstar like Dad! I was so proud, but did she really know what a Data Rockstar does? After we pulled together a super cool outfit with a custom Data Rockstar t-shirt, lanyard, Tableau Conference buttons and an awesome pair of glasses, we started talking about what data she might be interested in. 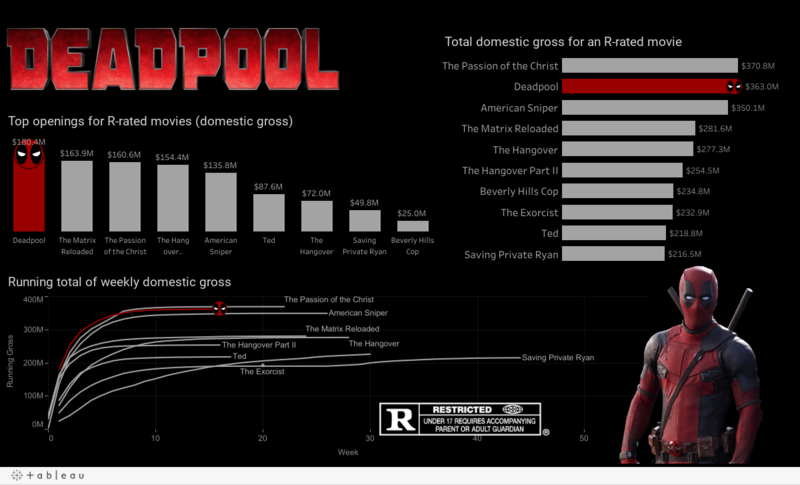 I started showing her some of my previous visualizations and she landed on Deadpool. 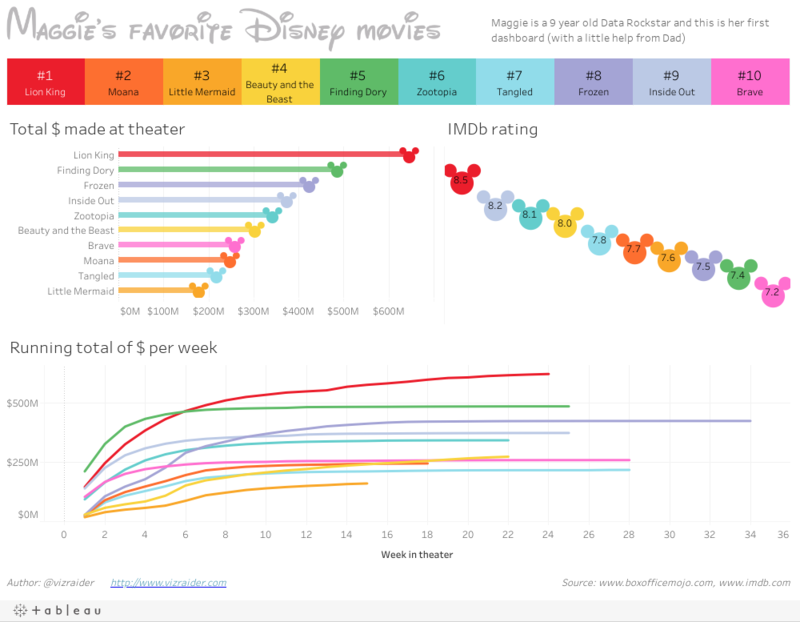 She asked, "Why did you have to make a viz about a movie I can't see? You should make one with kid-friendly movies." So we started with a list of her favorite animated Disney movies and I started gathering data. I showed her how to drag Dimensions and Measures out to the view and every time something changed it was "Wow! That was cool!" Who knew data viz could be so much fun for a 3rd grader? My favorite part? We pulled in the weekly box office gross and she said it didn't look right. It was backwards from my Deadpool viz. So I explained what a Running Sum was and walked her through adding the table calculation. Not too many 3rd graders can rock a table calc! 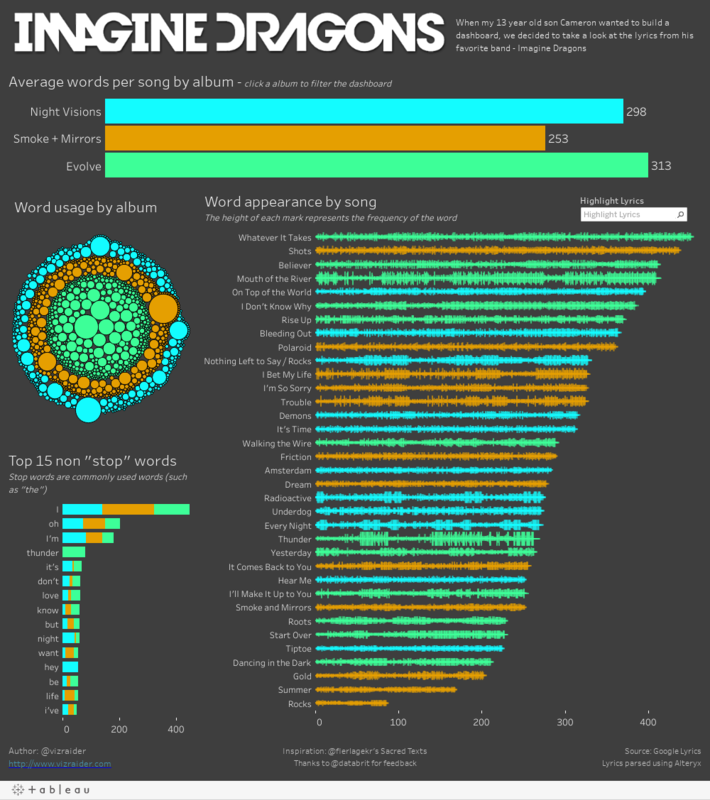 We ended up with what might be my favorite viz so far, because of how excited she was when it was finished. I went to the theater with a few buddies opening weekend to see Deadpool and I was shocked by how crowded it was. Sure it was Valentine's Day weekend, but still this was at 9pm and the theater was full. The following Monday I saw that the movie had the highest grossing opening weekend ever for an R-rated movie. So I thought I would head over to Box Office Mojo and take a look at the numbers. By the way, this movie really earned its R-rating. Don't get me wrong, I enjoyed the movie, but it is definitely NOT suitable for kids. The Official World Golf Rankings were established in 1986 to measure performance of professional golfers. These rankings change weekly and are based on tournament results from the previous 2 years. 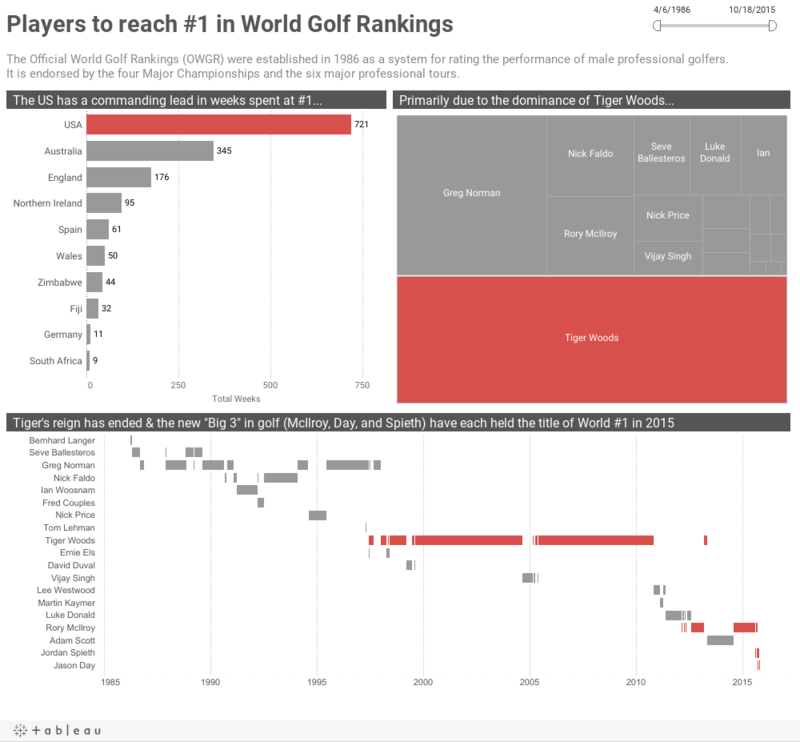 Certain tournaments such as the Major championships (Masters, US Open, Open Championship, and PGA Championship) and the four World Golf Championships use the rankings to determine which players are automatically qualified to enter the events. For the first 10 years of the OWGR, there were only 7 different golfers who held the title of World #1. The next 15 years brought forth the age of Tiger Woods. During a 12 year period from 1998 to 2010, Tiger was the world #1 90% of the time. Since 2010, there have been 8 different golfers (including Tiger for a 7 week span). This season there have been 7 changes in the #1 spot and the mantle has been passed to the new "Big 3" golfers in the sport - Rory McIlroy, Jordan Spieth, and Jason Day - all under the age of 30. 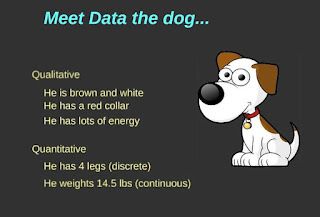 What can a dog teach you about data? I just got back from last week's Tableau Conference after spending a few extra days in Las Vegas. What an amazing week! This was my second conference and I can't wait until next year when the conference will be coming to Austin, Texas. As I met people at conference, I shared my Tableau journey over the last year. How I went to conference in Seattle without ever using the tool, taking 2 days of training, and starting this blog the day I came home. It has been an exciting year, and I have come a learned so much, but hands down the most rewarding experience was when I was asked to present about data at my son's school. Sharing this with people over the last week, many of them commented on my example of using a dog to teach 10 year kids about the different types of data. 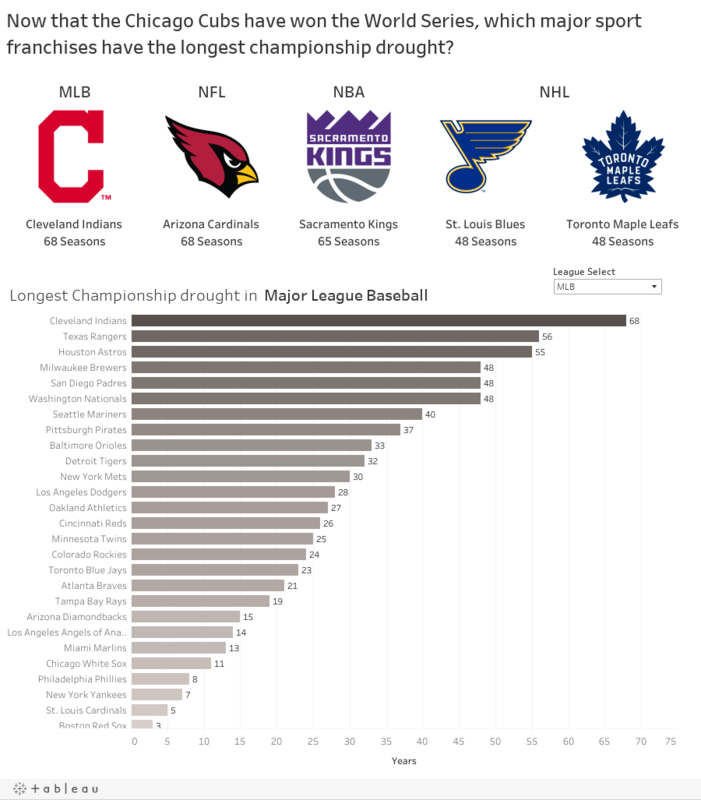 I was even mentioned by Tableau Zen Master Peter Gilks on his blog post of thoughts from conference. Some people thought that this analogy was a great tool to explain to their own children what they do everyday while others mentioned that it was a great way to educate their management on data types. So how can we use a dog to learn about data? Well as most of you know, data can be classified as either qualitative or quantitative. Since my audience was a group of elementary students, I looked for a way to keep the definitions simple and easy to remember. To help them remember it, I pointed out at the "Quantitative is about Quantity." These definitions are also useful when describing the difference between Dimensions and Measures to a new Tableau user. Once the students had a general understanding of the definition, I introduced them to Data the Dog and began asking questions. What is something qualitative about Data? How about something quantitative that is discrete? Can you combine qualitative and quantitative to describe him? Going in, I wasn't sure how well they would grasp the concept. I gave 5 different presentations that day to different classes. I thought there would be 1-2 students in each class that would provide answers, but I was wrong. In every session, multiple kids raised their hands and gave correct answers. One of the sessions was for my daughter's 1st grade class. I didn't want her to feel left out since I was at her school all day. Even they understood after a few examples! It was so fulfilling to see these kids get excited about data! One of the teachers even sent me an email the next day to tell me that the students had Chromebooks in class and they all wanted to build visualizations. Future Data Rockstars! I really enjoyed watching the Open Championship this year at the birthplace of golf - The Old Course at St. Andrews. By the final day there were 20 players within 2-3 shots of the lead at any given time. 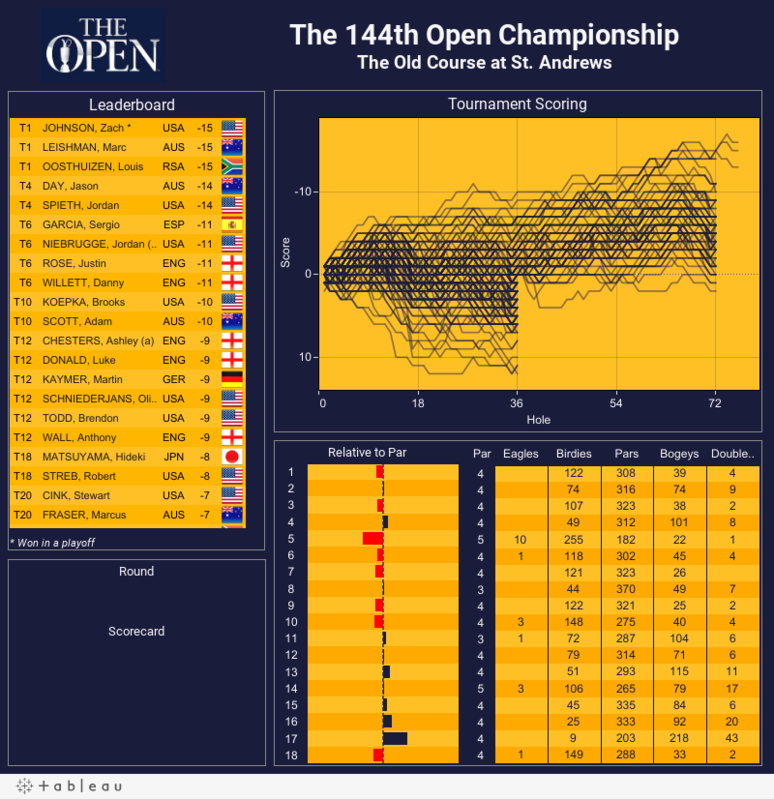 I quickly threw together a visualization of the leaderboard and tried to model it after the style of the iconic yellow scoreboards at the tournament.